Dealsmarket Ads may be presented via the pop-up windows and banners appearing on the web pages that you browse. These ads may promote surveys, prize giveaways, coupons, saving deals, and other kinds of offers. The ads may be presented according to the information you are interested in, and this information can be collected by the tracking cookies installed on your PC. Even though it is important to delete these cookies, it is far more important to remove Dealsmarket Ads, and we can show you how. It is unfair to discuss Dealsmarket Ads without mentioning the Justplugit engine. This engine is related to Dealsmarket and such clones as Savez, TakeShop, and CompareNBuy. We recommend removing all of the applications created using the Justplugit engine, because none of them are reliable or useful. Do you still think that Dealsmarket Ads are useful, and you want to find them while browsing the web? You certainly should not be fooled by the misleading promises of this advertisement-supported program, because it can promise you anything just to stop you from removing it. If you find Dealsmarket Ads, it is only a matter of time before you face other disturbances. The advert-supported program is likely to be installed onto your PC bundled with the malicious computer infections, which may be much more difficult to remove from your operating system. Dealsmarket Ads usually appear after activating the bundled installers by Installrex, Amonetize, and Vittalia. In the worst case scenario, you might need to delete Trojans, ransomware, keyloggers, and other malicious programs after trusting the unreliable software distributors. 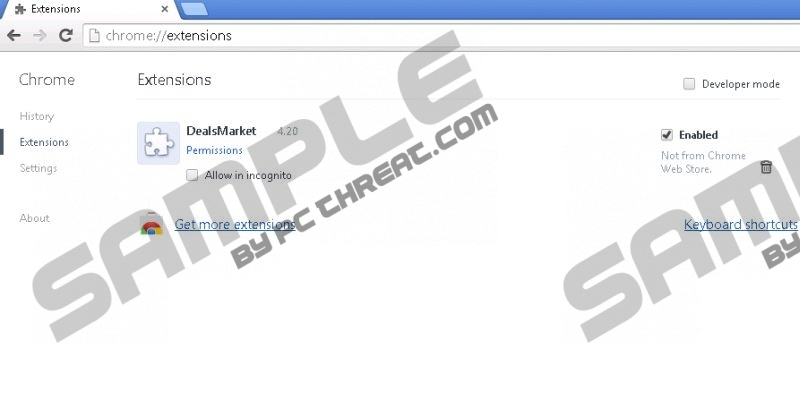 Dealsmarket Ads can show up on Google Chrome, Mozilla Firefox, and Internet Explorer browsers. They show up because of the successful communication between the advertisement-supported program and the adware servers. We recommend severing the ties with the unreliable servers, because you do not want your operating system exposed to the parties that use these servers. Unfortunately, Dealsmarket Ads could be used to promote unreliable offers as well, due to which you must remove the adware ASAP. Can you delete Dealsmarket Ads from your browsers? We are sure you can, but it all depends on the removal method you want to employ. Needless to say, you will spend more time and face more issues if you want to remove Dealsmarket from your PC manually. If you are not up to par to complete the task successfully, you probably should use the software that can delete malware for you. Install SpyHunter, an up-to-date automatic malware remover, and the security of your operating system will be taken off your shoulders. Launch RUN and enter Control Panel. Click OK.
Right-click Dealsmarket and select Uninstall to delete it. Click the Windows logo on the left of the Task Bar. Double-click Add or Remove Programs and locate Dealsmarket. Quick & tested solution for Dealsmarket Ads removal.